The resource requirements of the human race continue to escalate, with the United Nations anticipating a three-fold increase in resource usage between 2010 and 2050. In response, over the past few decades there has been an increasing focus on 'sustainability' initiatives like recycling and transitioning to alternative energy sources. However, all such measures to consume less can at best only constitute a short-term solution to the resource requirements of future generations. In the long-term, we will therefore need to move Beyond Sustainability to both consume less and find more. As the resource supplies of the Earth continue to dwindle, the only place we can find fresh supplies of both energy and raw materials is out in space. This could involve the mining of the asteroids and the Moon. But, before that occurs, our most likely option for obtaining exterrestrial resources is space-based solar power. Space-based solar power, also known just as space solar power, would generate off-world energy by placing solar power satellites in orbit. These would receive sunlight before it hit the Earth, and would wirelessly transmit their collected energy to a receiving station on the ground. For safe operation, wireless power transmission frequencies would need to be chosen that would not damage animals, plants or machines caught in the beam. Solar power satellites would be immune to cloud cover, the changing seasons, and atmospheric haze. In a geostationary orbit some 22,000 miles above the Earth, they would also be largely unaffected by night time shadow. Solar power satellites therefore have the potential to be around ten times more efficient than ground-based solar power installations. Designs for a space-based solar power system were first developed by an American engineer called Peter Glaser, who in 1973 obtained a patent for his 'method and apparatus for converting solar radiation to electrical power'. 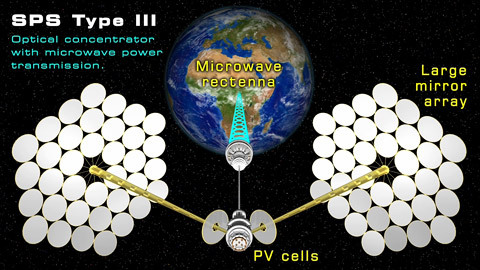 This envisaged solar power satellites with microwave antennas that would transmit power to large Earth-based receivers called 'rectennas'. Since Glaser's pioneering endeavours, significant development work has taken place in the United States, Canada, Europe, Japan, China and India. For example, in the 1970s, NASA and the US Department of Energy spent about $20 million on feasibility studies. Between 1995 and 1997, NASA again looked at space-based solar power under an initiative called Fresh Looks. In 2007, the US National Security Space Office also presented a detailed analysis, while in 2009 Pacific Gas and Electric, and the Japan Aerospace Exploration Agency (JAXA), both put forward ambitious plans. By 2010, in Europe EADS Astrium had also begun to seek partners for a demonstration mission. In 2011, the International Academy of Astronautics, or the IAA, then produced its highly detailed First International Assessment Of Space Solar Power. In April 2014 , JAXA even revealed plans for a space-based solar power system to provide energy to Tokyo by 2030. According to the 2011 IAA report, 'there are no fundamental technical barriers that would prevent the realization of large-scale SPS platforms during the coming decades.' Having considered many possible approaches, the IAA also highlighted three as the most viable. The IAA's Type I architecture is based on the now 'classic' Solar Power Satellite Reference System developed in 1979 by NASA and the US Department of Energy. Here, one or more very large arrays of photovoltaic solar panels are coupled to a microwave power transmission system. The architecture requires a large, stabilized platform that rotates on three axis to keep its solar panels pointed at the Sun, and its power transmission dish targeted at a receiving station on the Earth. 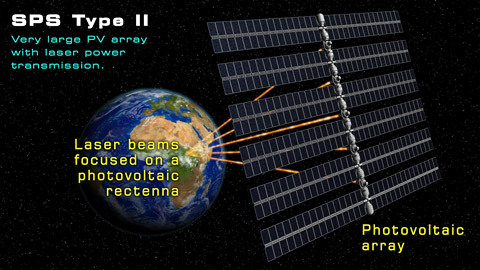 The IAA's Type II system transmits solar energy to the Earth using multiple lasers that target a photovoltaic rectenna. While solar-pumped lasers could be used to directly channel focused sunlight to the Earth, electric lasers are likely to prove more effective. Here, sunlight would be turned into electricity using large photovoltaic arrays as in a Type I system. But the power would then transmitted to the Earth by many laser beams operating at the near-visible part of the spectrum. A Type II architecture could comprise an integrated platform with multiple laser installations, or a constellation of single laser platforms. Finally, the IAA's Type III system is a based on a symmetrical optical concentrator or 'sandwich' design that does not require very large photovoltaic panels. Rather, vast arrays of mirrors collect and redirect sunlight onto much smaller photovoltaic solar cells. 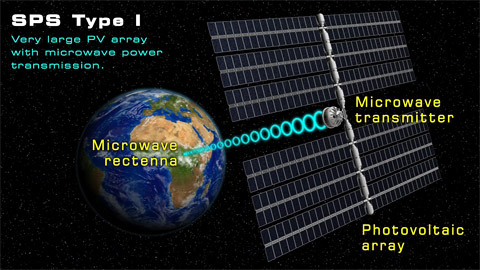 The electricity so created is then transmitted to the Earth via a single microwave link. Such an approach requires a less complex power management and distribution arrangement than in than a Type I or Type II system, as captured solar energy would largely be moved around via light redirection, rather than through a physical electrical infrastructure. Type III systems may therefore prove the most viable to construct. Given that all life as we know it depends on energy from the Sun, it is perhaps hardly surprising that interest in space-based solar power has been growing for over 40 years. Many tentative ventures have even been announced, although no major industrial player or government has yet committed significant resources. This said, several smaller firms -- including SpaceEnergy and Powersat -- continue to pioneer. The recent JAXA announcement also sounds rather hopeful. It is also worth noting that all of the technologies required to build solar power satellites already exist, with advancements in the necessary solar technologies continuing to be made. The transmission of energy over long distances using either microwaves or lasers is also long since proven. A few decades from now, Peter Glaser's vision of obtaining energy from space may therefore become a reality. You can read more about space-based solar power on the Citizens for Space Based Solar Power website. While space-based solar power may help to meet some of our future energy needs, it will not assist with the supply of physical resources. To fulfil our future requirement for new raw materials, space pioneers will subsequently have to travel far beyond the Earth to destinations including the Moon and the asteroids. Asteroids -- also known as minor planets or planetoids -- are chunks of space debris in orbit around the Sun. They are the material left over from the formation of the planets, and range from a few metres, to hundreds of kilometres in diameter. Most asteroids are located in the Main Asteroid Belt between the orbits of Mars and Jupiter. This contains millions of asteroids, of which 750,000 are more than 1 km across, with over 200 exceeding 100 km in diameter. Asteroids in the Main Belt are so spread out that most are hundreds of thousands of kilometres apart. 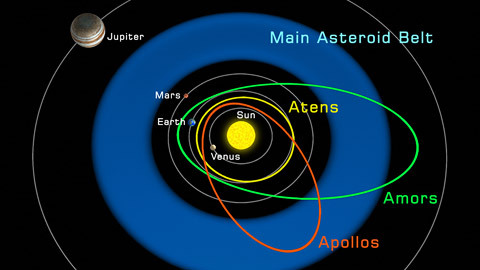 Located outside the Main Belt are three groups of 'near-Earth' asteroids called the Atens, the Amors and the Apollos. These contain about 9,000 asteroids, with nearly 1,000 more than a kilometer in size. Due to their relative proximity to our planet, some 1,500 near-Earth asteroids are prime candidates for mining operations. Asteroids are made of many different materials, with the majority classified as C-type, S-type or M-type. C-type or carbonaceous asteroids are the most common, are greyish in colour, and are thought to consist of carbon compounds, rock, up to 20 per cent water, and some metals. S-type or silicaceous asteroids are then greenish to reddish in colour, and are mostly made of iron and magnesium silicates, with smaller quantities of pure nickel and iron, as well as some platinum group metals. Finally, M-type or metallic asteroids are reddish in colour, and mainly composed of pure nickel and iron, with smaller platinum group deposits. A single, platinum-rich, 500 metre wide asteroid has been estimated to contain up to 174 times the yearly world output of this highly precious material, and 1.5 times the known world-reserves of platinum group metals. Out in space, the water to be found on C-type asteroids will be just as valuable as metal deposits, as water is a critical commodity both for sustaining humans in space, and as a source of oxygen for rocket fuel. Even basic asteroid rock may prove a valuable building material, as it could shield humans from deadly radiation. As all of these examples illustrate, there are significant possibilities to exploit asteroids as a valuable source of extraterrestrial resources. It has indeed already been calculated that some individual asteroids contain raw materials worth more than one hundred billion dollars. Asteroids are likely to be easier to mine than the Moon. This is because even the largest asteroids have very low gravitational fields. This means that it would be relatively straight-forward for spacecraft to both travel to asteroids, and to launch back into space. Extracted metals, water and other valuable raw materials could therefore be readily transported to the Earth or other locations, perhaps in vast rocket trains. Once suitable asteroids have been identified, they could be mined in various ways. For a start, on larger asteroids, bases may be established. Here any human quarters may be cut deep into the rock to provide shielding from deadly cosmic rays. 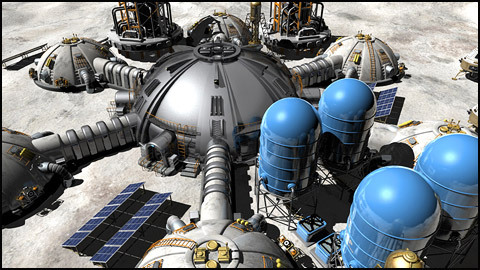 Industrial facilities attached to the surface of the asteroid would then process and store extracted materials. As an alternative to establishing long-term bases, limpet ships may temporarily attach themselves to asteroids large or small. 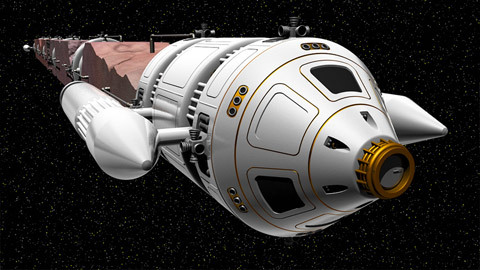 These potentially robotic mining craft would then eat into the surface, and accumulate extracted raw materials in their cargo bays. 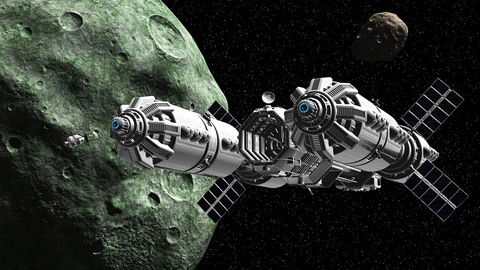 Limpet ships are likely to be the preferred option to mine smaller asteroids, or to extract concentrated deposits of critical materials from large asteroids that are largely comprised of less valuable rock. And as yet another option, processing stations may be positioned near a large asteroid or any densely populated part of a field. Small asteroids or laser-cut asteroid sections would then be fed to the processing station, refined into useful materials, and once again sent back to the Earth. Alternatively, rocket trains may transport small captured asteroids or asteroid sections to processing stations in Earth orbit. While asteroid mining may sound like science fiction, two companies already have pioneering ambitions. The first is Planetary Resources, which intends to bring the natural resources of space within humanity's economic sphere of influence. Also on an asteroid mining crusade is Deep Space Industries, who note that 'the resource potential of space outstrips that of any previous frontier - [and] without the environmental impacts'. Both Planetary Resources and Deep Space Industries plan to commence their off-world activities by prospecting with small satellites. 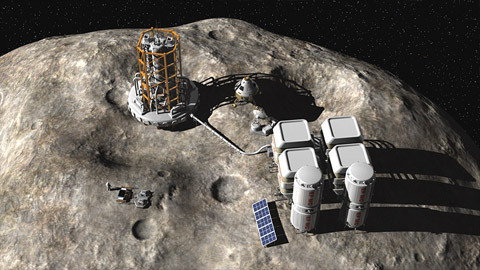 Asteroid mining will not be easy, and is currently not an economic proposition. But, with the natural resources demanded by humanity set to triple by 2050, and with finite materials here on Earth, we could be excavating space rock not that many decades from now. Further, by the middle of this century, there could also be mining operations on the Moon. Since the dawn of recorded history, human beings have looked up to the Moon. To date, only twelve of us have stood on its surface and looked back to Mother Earth, with the last Apollo astronaut having departed in 1972. But, over forty years on, there is now an increasing appetite for a return trip. In the last decade Russia, China and the United States have all signalled some level of intention to build a future lunar base. In December 2013, the Chinese Lunar Exploration Program even landed a robotic rover, while in April 2014 Russia reiterated its plans to inhabit the Moon 'forever'. In January 2014, NASA also announced a programme calledLunar CATALYST -- or 'Lunar Cargo Transportation and Landing by Soft Touchdown' -- that will help commercial companies to develop lunar transportation capabilities. Several private companies, including Moon Express and SpaceIL, now also have lunar ambitions. In part, such pioneers are being spurred on by the Google Lunar X Prize. This was launched in September 2007, and offers $30 million to the first private company to land a robot on the Moon, travel 500 meters, and send two high-definition "Mooncasts" back to the Earth. Thirty-three teams initially registered for this grand challenge to create another 'Apollo moment', with eighteen still in the game to reach the Moon by the competition deadline of 31st December 2015. Commercial organizations are interested in the Moon as a potential source of raw materials. In particular, our lonely satellite is thought to harbour substantial deposits of cobalt, iron, gold, palladium, platinum, titanium, tungsten and uranium. Since 2009, NASA experiments have also confirmed the presence of water on the Moon, which could prove critical in supporting long-term human occupation. However, the most valuable deposit may be a gas called helium-3 that could fuel future nuclear reactors. At present, all nuclear power stations use a process called nuclear fission to generate heat and subsequently electricity. Specifically, inside current fission reactors, atoms of uranium or plutonium are struck by neutrons that break them apart. This releases atomic energy, but also results in highly toxic nuclear waste. In contrast, in future nuclear fission power plants, two fuels could be atomically fused together in a reaction that would not create any nuclear waste. This is where helium-3 comes in, as it could be used in combination with deuterium to power fusion reactors whose only by-product is normal helium and stray protons -- although admittedly the latter will prove difficult to contain. Even so, helium-3/deuterium power stations do have the potential to safely fuel the world in the future. The problem is, helium-3 does not occur naturally on the Earth. It is, however, emitted by the Sun, and has been accumulating on the surface of the Moon for billions of years. Estimates suggest that there are now over 1.1 million tonnes of helium-3 captured in the first few metres of lunar top soil, and that around one hundred tonnes of helium-3 could fuel our entire planet for a year. Helium-3 is therefore worth billions of dollars a tonne -- so making it potentially economic to mine from the Moon, even with current space technology. To be commercially viable, any future helium-3 mining operation would have to excavate Moon rock and extract the gas from it on the lunar surface. Mining helium-3 -- or anything else -- on the Moon would therefore require the construction and operation of a significant industrial infrastructure. Such a facility could be powered by the Sun, and may in part be constructed from lunar materials. In fact, the European Space Agency has already funded experiments with a massive 3D printer that may build future lunar dwellings by spaying a binder onto successive layers of powdered Moon rock. This would rapidly produce a very strong and thick structure that would shield its occupants from cosmic rays. Over the years, The United States, Russia and China have announced various intents to prospect for helium-3 on the Moon, and to set up potential mining operations. But at the time of writing, only China has remotely significant plans with its Chang’e lunar exploration program that has the goal of sending astronauts to the Moon by the early 2020s. This is discussed in more depth by Fabrizio Bozzato in this June 2014 article for The Diplomat, which in turn is based on his far more extensive and excellent paper here. I also had a chat about the subject with the BBC a few weeks later, as you can hear here. To avoid the problems inherent in transporting physical materials across 250,000 miles of space, future lunar colonies may beam pure energy directly to the Earth using either microwaves or lasers. Such energy could be generated either by nuclear power stations constructed on the Moon, or else by vast solar arrays manufactured from lunar materials and spread across great swathes of the lunar surface. If this ever happens, the Moon may become the next, great super-power -- dependent on the Earth for some supplies, but dominating its economy. All of our endeavours to harvest off-world resources are going to be complex, risky and expensive. And yet, if we don't at least try to obtain resources from space, we face an inevitable future of increasing scarcity, mass depopulation, and relentless decline. As we pursue the new industrial frontiers of space-based solar power, asteroid mining, and mining the moon, we may perhaps additionally bolster the human spirit by creating a thriving space tourism industry, and just possibly by landing the first human being on Mars. Unless we become extinct first, the destiny of human civilization has to be to evolve into space. The ideas outlined on this page, and in my accompanying "Resources from Space" videos, may therefore be just the beginning . . .
Extraterrestrial Materials and Humans: Can Space Resources Save Our Civilization? You can also read about future space travel in my book 25 Things You Need to Know About the Future.